New York Sen. Charles Schumer announced that Democrats will depart from Senate procedure to highlight the secret drafting of the Senate Republican health care bill. 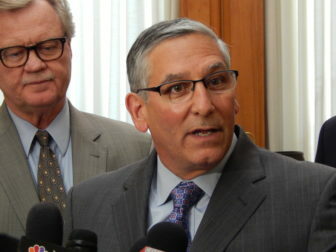 Washington – Democrats, with the help of Connecticut’s senators, plan to jam up the Senate this week to bring attention to Republican attempts to repeal and replace the Affordable Care act. Beginning Monday evening, the Democrats will use Senate procedures to try to block business both on and off the Senate floor. They say Republicans are using Senate procedures to keep the crafting of their health care bill from the public. “It is one of the cruelest, worst pieces of legislation to ever see the light of day in Washington, D.C. In fact, it has yet to see the light of day,” said Sen. Richard Blumenthal, D-Conn., at an “emergency field hearing” on the legislation in Hartford on Monday. “If Republicans won’t relent and debate their health care bill in the open for the American people to see, then they shouldn’t expect business as usual in the Senate,” Schumer said. Thirteen GOP senators are working on a plan to repeal and replace Obamacare, and Senate Majority Leader Mitch McConnell hopes to have a vote on the legislation before Congress’s July 4th recess. The senators decided to craft their own plan, instead of taking up a repeal bill called the American Health Care Act that was approved by the House last month. That bill, which President Donald Trump told Senate Republicans is “mean,” would end health coverage for about 23 million Americans, according to the Congressional Budget Office. Still, the Senate plan is expected to contain many of the AHCA’s features, including a reduction in federal spending on Medicaid, the joint federal-state health care plan for the poor that is known as HUSKY in Connecticut. What’s not known is the timeline for cutbacks in Medicaid money to the states, or the amount of subsidies available to help Americans purchase health insurance. Moderate GOP senator are looking for a longer timeline to cut Medicaid money and more generous subsidies while conservative Republican senators are seeking quicker and deeper cuts to Medicaid and smaller subsidies. Democratic senators, including Blumenthal and Sen. Chris Murphy, plan to debate healthcare on the floor in a series of speeches that are expected to go late into the night. They also were expected to use parliamentary tactics to force the Senate to consider the AHCA in committee, which would force the GOP to work on its health bill in public. Senate Democrats are resorting to this tactic because they don’t have the votes to block the GOP health care bill, which will need 50 votes for approval, with the vice president casting a tie-breaker. Republicans, who hold a 52-48 majority in the Senate, can’t afford to lose more than two votes. 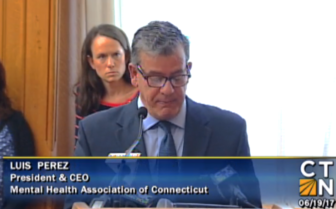 Luis Perez, president and CEO of Mental Health Connecticut, speaks at sen. Richard Blumenthal\’s field hearing on health care. Democratic frustration over the process Republicans are using to craft their health care bill is boiling over. Last week, in a Senate Health, Education, Labor and Pensions Committee hearing on the rising price of pharmaceuticals, Democrats on the panel repeatedly demanded the bill go through the committee process. At Blumenthal’s field hearing on the GOP’s health care bill, health care advocates and patients criticized the Republican health care bill, saying it would strip people of coverage while giving the wealthy a tax cut because it would repeal many of the taxes that fund the ACA. “I have been doing this work since 1977… Never, in those 40 years, have I witnessed the kind of secrecy and determination to take away health coverage or any other benefit,” said Judy Stein of the Center for Medicare Advocacy. “People will lose their health. People will die,” Perez said of an ACA repeal. Blumenthal’s hearing elicited a pushback from Republican officials in Connecticut, who said they were blocked from participating in the event. There are two health insurance carriers remaining in Connecticut’s ACA exchange, called Access Health. Anthem and ConnectiCare cover about 100,000 individuals in Connecticut though the exchange. But both insurers have asked the Connecticut Insurance Department for sizable rate increases in 2018 and said they may leave the exchange if Trump does not continue certain payments that reduce out-of-pocket costs for low and moderate income Americans. If the insurers quit the exchange, about 73,000 individuals in Connecticut would lose ACA subsidies to purchase insurance. Many of those people also would lose federal help to pay out-of-pocket costs like deductibles and co-payments. Democrats blame the loss of insurers in ACA exchanges on GOP “sabotage” of Obamacare and the uncertainty the repeal efforts have generated.